Lingner began dancing in a small studio in Indianapolis at the age of five. After high school, Chris was cast in the national tour of “Movin Out” [Eddie, James, Ensemble]. In ’09-10 he was cast in the first Broadway musical on a ship in “Hairspray” [Brad] and was a featured aerialist in the revue show, “Come Fly With Me,” on the Oasis of the Seas. Chris also performed with Las Vegas Star, Clint Holmes in his new musical “My Own Song” at Flatrock Playhouse. Chris has been a featured guest artist with Gregory Hancock Dance Theatre and Indianapolis School of Ballet. Intensive training includes studies at Hubbard Street Dance Chicago and Nederlands Dans Theatre. 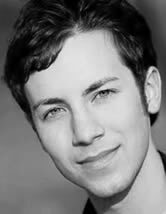 Chris is in his second year studying ballet in the Jacob’s School of Music at Indiana University where he has performed works by Twyla Tharp, Anthony Tudor, and Paul Taylor and in principle roles in works by Michael Vernon, Josh Bergasse, and George Balanchine.